← Love & Hip Hop’s Mimi Faust Pregnant? Chris Brown has just been sentenced to spend another 4-plus months in jail … for violating his probation in the Rihanna case … but the reality is, he could be released by week’s end. Brown was in court Friday afternoon … where he admitted he violated his probation by getting into a fight with a dude in Washington D.C.
That’s all the judge needed to hear. He sentenced Chris to 1 year in jail. HOWEVER, Chris got credit for 116 days he spent in rehab, and another 59 days behind bars. That leaves 131 days in the pokey. But we’re told the L.A. County Sheriff’s Dept has been releasing inmates sentenced to 1 year after 240 days. And here’s the thing. Chris gets credit for 2 days for every 1 he served behind bars, so when you add it up, he has credit for 234 days — 6 days shy. So he could be released in days. The judge could have gone a lot harder — 4 years in prison. 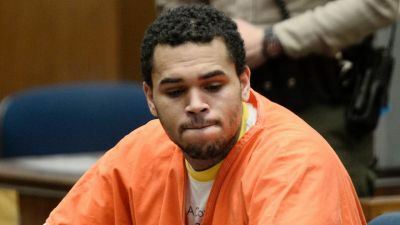 But Chris got a break because the judge took into account he was recently diagnosed with bipolar disorder, which could account for some of the violence. The judge also ordered Chris to attend therapy sessions with a shrink 2 times a week. And he must submit to random drug testing 3 times a week. Chris is not out of the legal woods … his D.C. assault trial is set to start in the following months. This entry was posted in Celebs, Entertainment News and tagged #FreeBreezy, assault, Chris Brown, Criminal, Extended, fight, jail, Mental Disorder, probation, r&b, rehab, release date, Rihanna, Serving Time, singer, Violating. Bookmark the permalink.